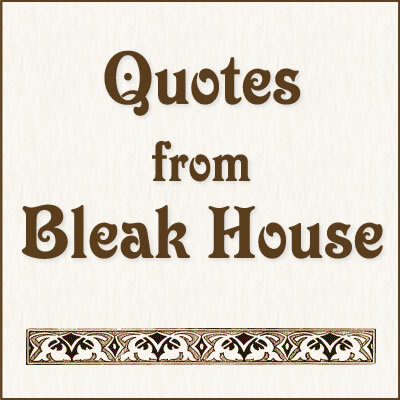 This list of characters from Bleak House is presented in alphabetical order. Carstone, Richard – A possible heir in the Jarndyce vs. Jarndyce lawsuit. He and his cousin, Ada Clare, are wards of John Jarndyce. Richard and Ada fall in love and are wed. Richard can not ignore the lure of the possible wealth that would be his if Jarndyce vs. Jarndyce is settled in his favor. His obsession with the case ruins his health and leads to his death. Scores of persons have deliriously found themselves made parties in Jarndyce and Jarndyce without knowing how or why; whole families have inherited legendary hatreds with the suit. The little plaintiff or defendant who was promised a new rocking-horse when Jarndyce and Jarndyce should be settled has grown up, possessed himself of a real horse, and trotted away into the other world. 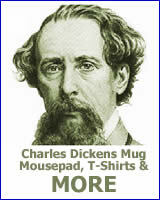 Fair wards of court have faded into mothers and grandmothers; a long procession of Chancellors has come in and gone out; the legion of bills in the suit have been transformed into mere bills of mortality; there are not three Jarndyces left upon the earth perhaps since old Tom Jarndyce in despair blew his brains out at a coffee-house in Chancery Lane; but Jarndyce and Jarndyce still drags its dreary length before the court, perennially hopeless. Clare, Ada – A possible heir in the Jarndyce vs. Jarndyce lawsuit. She and her cousin, Richard Carstone, are wards of John Jarndyce. Richard and Ada fall in love and are wed.
Dedlock, Lady Honoria – Before she married Sir Leicester Dedlock, Honoria loved Captain Hawdon. She was told he’d died. She was also told their daughter, Esther, had died. Lady Dedlock leads a very introverted existence. When she fears that her secrets will be made public she runs away. She dies near the graveyard where her true love, Captain Hawdon, is buried. Esther, Ada, and Richard talking with Miss Flite. 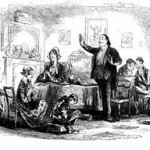 Flite, Miss – Miss Flite is another possible heir in Jarndyce vs. Jarndyce. She attends the court proceedings faithfully and her life revolves around the case. Krook is her landlord. Guppy, William – A humorous character who is employed as a clerk by Kenge and Carboy. He falls in love with Esther Summerson and is dismayed when his advances are rejected. Hawdon, Captain – In his youth Captain Hawdon and Lady Dedlock were lovers. He is the father of Esther Summerson. Jarndyce, John – The guardian of Esther Summerson, Ada Clare and Richard Carstone. 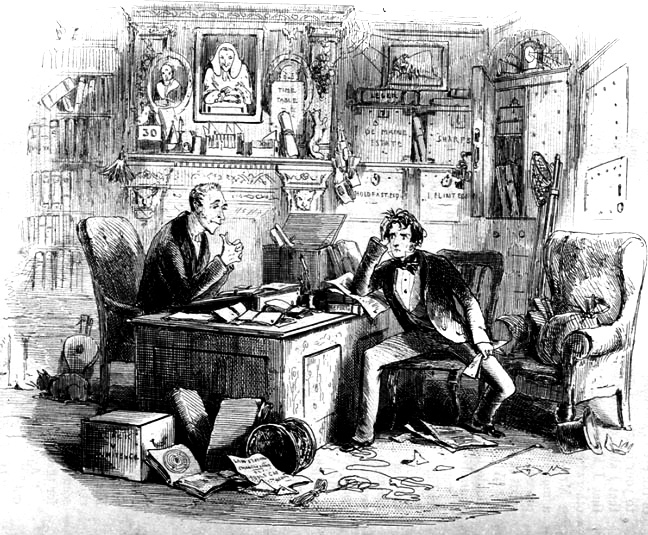 John Jarndyce warns Richard about the dangers of pursuing Jarndyce vs. Jarndyce. Krook – The landlord of Miss Flite. He has the dubious distinction of dying by spontaneous combustion. 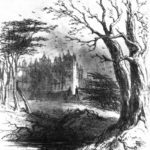 Summerson, Esther – Ether narrates long portions of Bleak House. Esther’s parentage is a mystery for much of the novel. Esther’s guardian later in life is John Jarndyce. He arranges that Esther act as companion to Ada Clare. 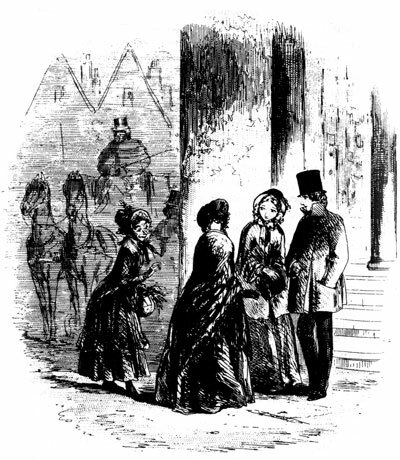 During the course of the novel Esther discovers her parents are Lady Dedlock and Captain Hawdon. Esther marries Allen Woodcourt. Tulkinghorn – Tulkinghorn is the lawyer of Sir Leicester Dedlock. He discovers Lady Deadlock’s secrets and considers exposing her. Later he is murdered by Lady Deadlock’s maid, Hortense. Mr. Tulkinghorn, sitting in the twilight by the open window, enjoys his wine. As if it whispered to him of its fifty years of silence and seclusion, it shuts him up the closer. More impenetrable than ever, he sits, and drinks, and mellows as it were in secrecy, pondering at that twilight hour on all the mysteries he knows . .
Woodcourt, Allen – Allen is a doctor. He loves Esther Summerson and marries her at the end of the novel. Where do the X-Files and literature combine? Bleak House! 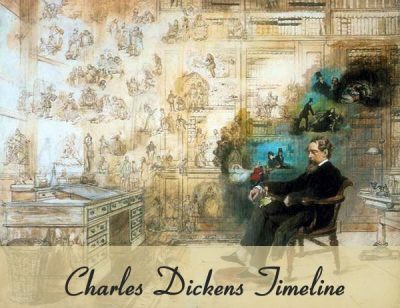 This novel has the odd distinction of being perhaps the only work of classic literature featuring a character that dies by spontaneous combustion.